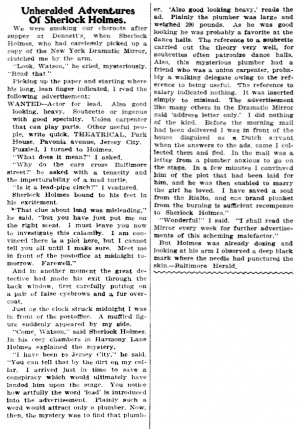 Unheralded Adventures of Sherlock Holmes is an American Sherlock Holmes pastiche written anonymously and published in The Baltimore Herald and in The Wichita Daily Eagle on 31 january 1904. We were smoking our cheroots after supper at Dennett's, when Sherlock Holmes, who had carelessly picked up a copy of the New York Dramatic Mirror, clutched me by the arm. "Look, Watson," he cried, mysteriously. "Read that." WANTED — Actor for lead. Also good looking, heavy. Soubrette or ingenue with good specialty. Union carpenter that can play parts. Other useful people, write quick, THEATRICAL, Park House, Pavonia avenue, Jersey City. Puzzled, I turned to Holmes. "Why do the cars cross Baltimore street?' he asked with a tenacity and the imperturability of a mad turtle. "Is it a lead-pipe cinch?" I ventured. Sherlock Holmes bound to his feet in his excitement. "That clue about lead was misleading," he said, "but you have just put me on the right scent. I must leave you now to investigate this calamity. I am convinced there is a plot here, but I cannot tell you all until I make sure. Meet me in front of the postoffice at midnight tomorrow. Farewell." And in another moment the great detective had made his exit through the back window, first carefully putting on a pair of false eyebrows and a fur over-coat. Just as the clock struck midnight I was in front of the postoffice. A muffled figure suddenly appeared by my side. "Come, Watson," said Sherlock Holmes. In his cosy chambers in Harmony Lane Holmes explained the mystery. "I have been to Jersey City." he said, "You can tell that by the dirt on my collar. I arrived just in time to save a conspiracy which would ultimately have landed him upon the stage. You notice how artfully the word 'lead' is introduced into the advertisement. Plainly such a word would attract only a plumber. Now, then, the mystery was to find that plumber. 'Also good looking heavy,' reads the ad. Plainly the plumber was large and weighed 200 pounds. As he was good looking he was probably a favorite at the dance halls. The reference to a soubrette carried out the theory very well, for soubrettes often patronize dance halls. Also, this mysterious plumber had a friend who was a union carpenter, probably a walking delegate owing to the reference to being useful. The reference to salary indicated nothing. It was inserted simply to mislead. The advertisement like many others in the Dramatic Mirror said 'address letter only.' I did nothing of the kind. Before the morning mail had been delivered I was in front of the house disguised as a Dutch servant when the answers to the ads, came I collected them and fled. In the mail was a letter from a plumber anxious to go on the stage. In a few minutes I convinced him of the plot that had been laid for him, and he was then enabled to marry the girl he loved. I have saved a soul from the Rialto, and one brand plunket from the burning is sufficient recompense to Sherlock Holmes." "Wonderful!" I said. "I shall read the Mirror every week for further advertisements of this scheming malefactor." But Holmes was already dozing and looking at his arm I observed a deep black mark where the needle had punctured the skin. This page was last edited on 28 August 2017, at 11:56.